Here's a novel little head-to-head game that puts each player in control of a frog on a pair of lily pads. Bugs flutter overhead, and you score points by leaping up and snatching them with your sticky tongue. Ideal to play on a hot summer evening (in the comfort of air conditioning of course), Frog Bog features peaceful pond scenery, natural sound effects, and a colorful sunset culminating in a star-lit sky and the sound of crickets. The little frogs are nicely animated, and there are four varieties of bugs you can catch. Lightening bugs come out at night, which is a nice touch. I really like the splash sound effect when your frog overshoots his pad, which unfortunately happens a lot. Frog Bog looks great, but lousy controls are its downfall. 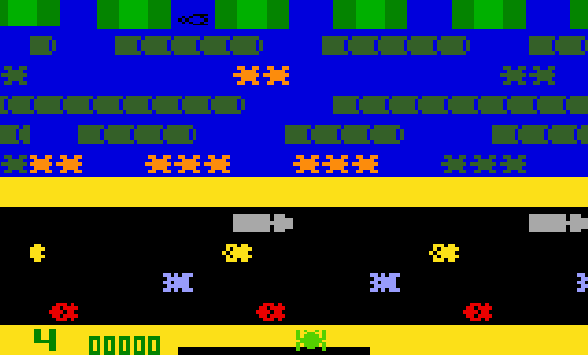 As much as my friends rave about the Atari 2600 version of the game (Frogs and Flies, M-Network), they were really turned off by Frog Bog's clumsy, imprecise controls. You're supposed to be able to control the jump's angle and distance, but the Intellivision controller is not up to the task. Another issue is the extremely erratic flight paths of the bugs. These two issues combined make the game feel more an exercise in luck that skill. 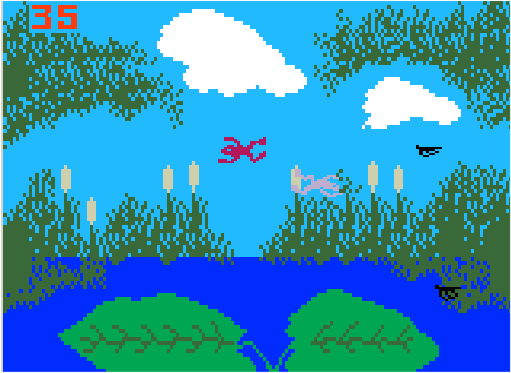 Frog Bog is first-rate in terms of graphics and sound; too bad its gameplay isn't up to the same standard. © Copyright 2007 The Video Game Critic. Seasonal summer fun Chicks Dig This! Sorry, but I couldn't help but notice how the Intellivision Frogger doesn't look or sound nearly at good as its Atari 2600 cousin. 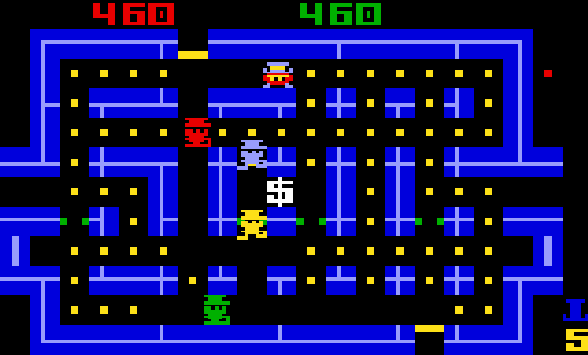 The graphics are extremely blocky (especially the cars), and the music doesn't have the harmony of the 2600. Beyond those comparisons however, this is still a fun game. All the elements of the arcade game are here -- including otters, which I don't recall seeing in any other home versions of the game. The gameplay is decent, but there is occasional slowdown, as well as an annoyingly long pause after you die. I get the feeling Parker Brothers could have done a better job with this. © Copyright 2000 The Video Game Critic. Oh yeah - this is a good one. Although Happy Trails borrows heavily from Locomotion; it's actually a major improvement, featuring streamlined gameplay and smoother graphics. 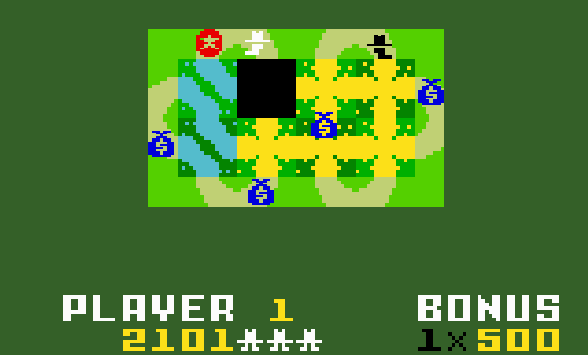 The game features a little white hat (with feet of course) walking around a maze that's broken up into squares. By sliding these squares around, you must alter his path and guide him to the bags of money. In later levels there's a black hat that you have to avoid, adding to the challenge and complexity. Happy Trails takes a while to get the hang of, but once you do it's very satisfying. As you progress, the mazes become larger and more complex. A range of options offer standard mazes, random mazes, and a pair speed settings. Not a big hit in its time, Happy Trails is a real gem. © Copyright 2001 The Video Game Critic. Not only is this a fun game, but it can teach you a thing or two about gambling. One to six players begin with $750 each and bid on a series of four-horse races. Prior to each race, you view the recent history of each horse before placing your wager. There are two types of bets: Win and Exacta. Once the race begins, you are not just a spectator. No, you'll actually get one chance to strategically "coax" and "whip" your horse. While these actions don't make a dramatic difference, they could be critical in a close race. 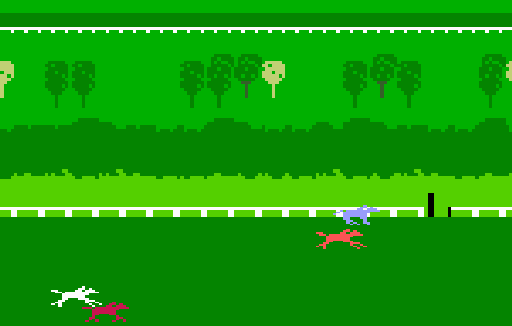 Horse Racing is a well-designed game, and the screens are chock-full of information and stats. The racetrack graphics are good, although the horses are small. The instruction manual steps you through the game and provides useful background information. If there's one problem with this game, it's the fact that there's minimal action, and the races usually aren't very close. Still, this offers as much as you could expect from a horse racing title. © Copyright 2000 The Video Game Critic. When I play a game like Hover Force, I have to tip my hat to those programmers who worked for INTV. You'll see things in this game you would never expect to see on an Intellivision. Hover Force is a first-person helicopter shooter where you fly over a city while destroying terrorist helicopters and extinguishing fires. Upon selecting your starting level, you're treated to an amazing cinematic intro of your pilot entering his aircraft, giving the thumbs up, and taking off. It's really impressive! Once in the air, you have an aerial view of the city with a gunsight in the center of the screen. As you scroll around you'll enjoy rich scenery that includes skyscrapers, bridges, basketball courts, train tracks, and scenic parks. You can move pretty quickly, but momentum plays a large role. Pressing zero on your keypad brings up a radar screen showing a map of the city with "blips" indicating enemies and fires. What's cool about this is how you can actually continue to navigate while using this screen. You can fire either missiles or water, and I love how enemy helicopters break into pieces when shot. They also have a habit of shooting star-shaped missiles at you that seem impossible to avoid. But the biggest flaw in Hover Force is the difficulty in tracking terrorist helicopters. In advanced stages these guys tend to move so fast that trying to get one to appear on your main screen can be maddening. If you can take care of business without running out of fuel, you head back to base where you are graded on your performance. It's not as fun as it is technically impressive, but Hover Force is still a nice addition to any Intellivision collection. © Copyright 2008 The Video Game Critic. 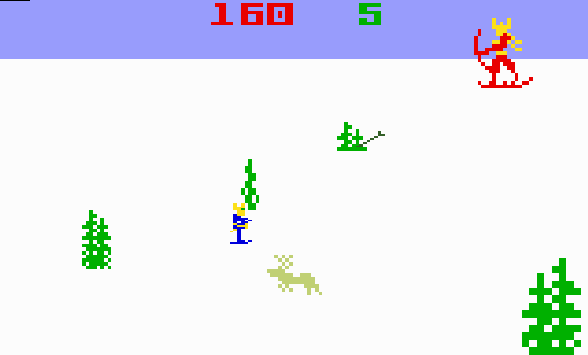 Like most Imagic games, Ice Trek is a visual work of art. In fact, you'd be hard-pressed to find a better-looking game on the Intellivision. Unfortunately, two of the game's three stages are mediocre, and one is frustrating as hell. You control Vali the Avenger, a warrior on a perilous ice trek to find and destroy the Ice Palace of Kaltkron the Terrible. The first stage puts Vali in a pair of skis, walking through a forest as a herd of caribou stampede his way. The use of different sized trees gives the screen some depth, and the caribou are nicely animated. Snow always looks great in video games for some reason. Besides dodging caribou, Vali can also strike them down with his axe. It's sort of like Stampede (Activision) in reverse. A "wildlife goddess" (who looks like the devil) occasionally materializes and shoots arrows at you. The stage looks great but doesn't quite fit my description of fun. It's the second stage however where the wheels come off. This time you must construct an ice bridge across a river of stray icebergs. To do this, you throw a grappling hook to pull in icebergs and extend your bridge. You can also use a torch to melt approaching icebergs that threaten to smash your bridge. The concept itself is pretty original, but the execution is painful. It's difficult to aim where your hook is thrown, and you're constantly sliding off of that narrow strip of ice. This torturous, overly-long stage is murder on your thumb, and only the most dedicated gamers will overcome it to witness the final stage. In the grand climax, a huge, colorful ice castle fills the screen, and Vali must shoot fire at certain targets while avoiding the black crystals that rain down. When all the targets are hit, the castle melts and crumbles into the sea, in what has to be the best ending ever for an Intellivision game. And believe me, if you made it that far, you've earned it! © Copyright 2002 The Video Game Critic. Here's an interesting game that was only available through a special Kool-Aid promotion. If you're already familiar with the Atari 2600 version, you can rest assured that this Intellivision edition is far more sophisticated. The graphics are fantastic. You control two kids walking around a colorful three-story house complete with stairs, furniture, doorways, and windows. The well-animated children move as a pair, trying to avoid the "thirsties" which randomly float around. Your mission is to collect the sugar, Kool-Aid, and pitcher items, and to be honest, this part of the game is kind of slow and tedious. The bad guys aren't particularly aggressive, but if the kids do get caught, you're treated to a blood-curdling scream! General Foods reportedly wanted this alarming sound effect removed from the game, but the programmer had already quit so it stayed in! After you combine the proper ingredients, the second part of the game kicks in. After an impressive intermission depicting the Kool-Aid Man busting through a brick wall, you have him go postal on those "thirstie" bastards. You can move him all over the place, snagging the bad guys and catching floating fruit. It's like a bonus round, but once it's over you're back to those lame kids, and who wants to go through that again? © Copyright 2001 The Video Game Critic. Despite some reservations, I was very impressed with this casino-style card game. One or two people can play blackjack or three kinds of Poker (5 card stud, 7 card stud, 5 card draw). 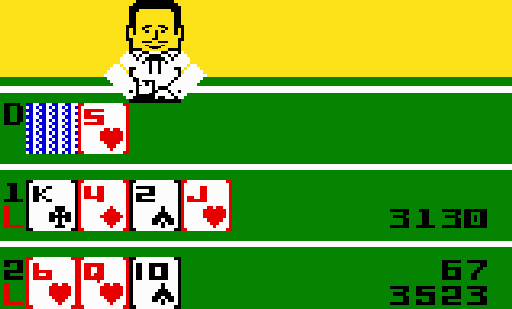 The graphics are sharp and it's easy to read the cards, but the best aspect of the game is the dealer. Not only does he look good when he deals, but he makes some funny facial expressions (depending on how well you're doing). The Intellivision control pads are well-suited for this type of game, with specific buttons assigned to hit, stand, or double down. This is definitely one the better classic card games. © Copyright 2000 The Video Game Critic. In 1982 Pac-Man was taking the arcades by storm, and Mattel needed an answer to keep their system relevant. Enter Lock N Chase. It may not have set the world on fire, but most Intellivision fans regard this as a legitimate classic. Playing the part a bank robber on the run, Lock N Chase was one of the first games that let you be "the bad guy". Granted, a furry little gremlin wearing a top hat may not match the standard profile, but those shifty eyes of his are devious! Lock N Chase is a thinking-man's Pac-Man. You're pursued by four policemen, and while you can't turn the tables on them, you can shut doors behind you to slow their pursuit. On occasion you can "trap" them, and it's even perfectly reasonable to trap yourself under the right circumstances. Examine the maze closely and you'll notice white lines indicating where these temporary doors can be placed. I like how the doors gradually disintegrate after a few seconds. The police are relentless and intelligent. You can't easily fake them out, as they tend to mimic your movements. To maximize your score you'll want to nab any bonus items (dollar signs, phones, briefcases) that appear at the center of the screen. And don't relax once you clear the maze, because you're not out of the woods until you exit through the escape hatch. This game makes me wish the Intellivision had joysticks, because navigation is tricky with the directional pad. Even so, Lock N Chase is madly addictive, and if you find your scores getting progressively worse, that's because the game baits you into taking risks. That's a sign of a good game, and Lock N Chase provides some of the best arcade action the system has to offer. © Copyright 2010 The Video Game Critic. This is a truly innovative game that demands fast thinking in addition to quick reflexes. Locomotion features a little train engine traveling through a maze of tracks. 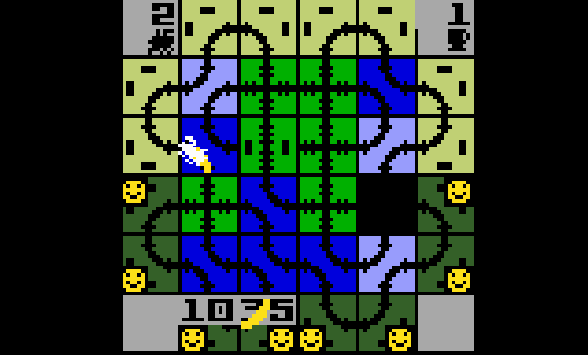 The tracks are broken up into squares, and by rearranging the squares on the fly, you guide the engine to waiting passengers while avoiding dead ends. You really have to experience this game to fully realize the genius behind it. Later stages feature runaway cabooses that make your job harder. The controls are very good, and there's even a "panic" button that acts like a railroad version of hyperspace. The graphics don't exactly set the world on fire (the cabooses look like blobs) but the locomotive sound effects are nice. Locomotion never got the credit it deserved, perhaps because it's too difficult and complicated for its own good. Still, strategy-minded gamers looking for a challenge will love it. © Copyright 2001 The Video Game Critic.